We just completed another installation of a Ford Transit Weatherguard van shelving for Ewald Venus Ford. Weatherguard has many van shelving options available for the contractor depending on the Ford van purchased. A contractor can pick a standard Ford Transit Weatherguard van shelving package or customize it for specific applications. 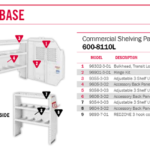 Van shelving is available in 13.5″ and 16″ widths and different heights. If you need to carry a ladder there are many options available. For the low roof and mid roof Topper Mfg. make a hot dipped galvanized rack that is great for carrying items of different lengths and widths. For the high roof van Weatherguard manufactures a drop down ladder rack that makes it easier to get your ladder down from the roof. 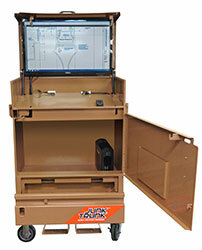 If storage is required in the cab a command center is available. You can also check on our site for for pricing. Another option available when security is required are slick locks. They are installed without having to drill any holes in the van. The contractor can also incorporate floor drawer unit that are lockable. Many other accessories are available from Weatherguard. If you already own a van and would like to update we have installation available at our St. Francis location. Packages are also available for GM vans, Promaster and Promaster City, Merceds Sprinter and Metris, and Nissan NV and NV200. With all these options there is no reason for a contractor to not have a van that is a rolling work shop. OSHA increases fines August 1st. Effective August 1, 2016; OSHA will increase the max fine amount from $70,000 to $124,000 for willful (knowing the law but ignoring it) and repeat violations. You know the law – do not fail to train your crew. I found this article and thought I you should know. OSHA penalties set to skyrocket: Are you in compliance? For 25 years, the maximum penalty amounts for violations of the Occupational Safety and Health Act have remained frozen. A thaw is about to set in — and quick. This provision does two things. First, it directs the Occupational Safety and Health Administration to make a “catch-up” adjustment, and bring the agency’s penalties in line with inflation since 1990, which is the last time they were increased. Second, it amends the law to allow OSHA to increase the penalty amounts ever year in accordance with the Consumer Price Index. Currently, the maximum penalty that OSHA can impose for “other-than-serious” and “serious” violations is $7,000, and the maximum penalty for “willful” or “repeat” violations is $70,000. This new law directs OSHA to increase both of those penalty amounts to correspond with the rate of inflation as it was recorded between 1990 and 2015. The relevant CPI data were released on Nov. 17, and the maximum increase has accordingly been set at 78.16 percent. This means that OSHA has the authority to increase the maximum penalties to $12,471 for other-than-serious and serious violations and to $124,709 for willful or repeat violations. The change is scheduled to happen no later than Aug. 1, 2016, but we expect OSHA to act sooner than that using an interim final rulemaking. Although this change does not alter an employer’s obligations to comply with the Occupational Safety and Health Act, it does substantially raise the stakes for those who fail to comply. Even employers with spotless safety records could now face fines in the six figures for a first OSHA offense. The changed circumstances make it even more essential for employers to take preventative steps such as providing safety training and conducting self-audits. It is also now more important to ever to seek out experienced counsel when OSHA comes knocking. The lawyers on Whyte Hirschboeck and Dudek’s Occupational Safety and Health Team are available 24 hours a day, seven days a week, and can work with you through every step of OSHA compliance, investigation and litigation processes. For more information, contact Erik Eisenmann at 414-978-5731 or eeisenmann@whdlaw.com, David Hertel at 414-978-5303 or dhertel@whdlaw.com, or another member of WHD’s Occupational Safety & Health Team. I would like to invite you to our annual open house May 14th, 2015. We will again feature our pig roast for lunch. All our equipment will have an additional 10% off that day. We will have factory reps doing demos on their equipment. We will be featuring a couple of new items. The first is the redesigned shingle hoist from Tranzsporter. 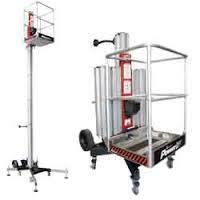 It features a new platform, the 200lb model hoist features a 25% increase in lifting capacity, up to 250 lbs(TP250). The new collapsible carriage comes with cam followers for better tracking and handling. Carriage also features an aluminum deck and flap for lighter weight and longer life. A rolled goods/plywood bracket comes with unit and pins into carriage. For heavier roofing materials, the 400 lb. platform hoist features a lighter weight carriage and revised track system. The TP400 carriage has a 30% reduction in weight over previous models. The aluminum deck and flap provide longer life and lighter weight. This carriage also features a re-engineered and simplified cam follower system with less wear parts than other hoists. Rolled goods/plywood brackets comes included and pins into carriage. Tranzsporter has also developed a new roof guard rail system. It’s the quickest and easiest guardrail system to install, tear down and no tools required. Galvanized for the same price or less than competitor’s painted steel guardrails. We will also be demonstrating the Reechcraft powermast system. The PowerMast is great for mid to high access needs, offering unmatched portability and simplicity for a wide variety of wall access needs, up to 200+ feet. The tools-free mast assembly is not only easy to put together and connect, it is so compact a 65 ft. twin system can fit in the back of your truck or van! We will have a unit set up at the show. We will also be demonstrating the Powerlift. 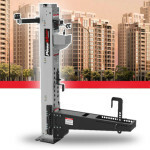 The PowerLift is a triple threat: convenient, secure and easy to use. It provides additional security and safety, while still helping you gain access to difficult-to-reach indoor and outdoor spaces. 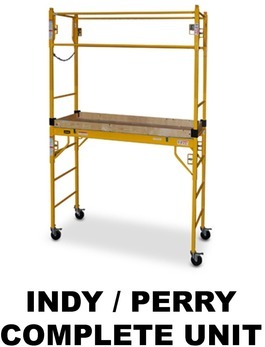 One person can easily move and operate this equipment up stairs or inclines – it’s the lightest low-level lift on the market. 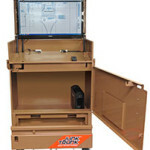 Knaack reps. will also be demonstrating the new model 118-M Data Vault. A step above the traditional jobsite protection device, KNAACK® DataVault™ mobile provides a highly mobile jobsite connectivity solution, empowering productivity and digital collaboration. KNAACK® DataVault™ arrives on the job ready for use, and is supported with a nationwide manufacture certified support network to bring agile solutions to customers. Please contact chuck@birdladder.com to reserve a spot. The fall protection classes are limited to the first 20 registered. 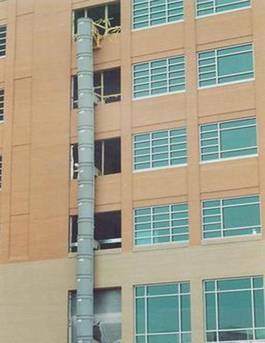 Why Use Construction Trash Chutes? Working on a construction project on a multi-story building can lead to some logistical issues when it comes to disposal of debris. It is important in such a situation, for both safety and efficiency reasons, to use a trash chute. Beginning January 1, 2015, there will be a change to what covered employers are required to report to the Occupational Safety and Health Administration. Employers will now be required to report all work-related fatalities within 8 hours and all in-patient hospitalizations, amputations, and losses of an eye within 24 hours of finding about the incident. Previously, employers were required to report all workplace fatalities and when three or more workers were hospitalized in the same incident. The updated reporting requirements are not simply paperwork but have a life-saving purpose: they will enable employers and workers to prevent future injuries by identifying and eliminating the most serious workplace hazards. Employers have three options for reporting these severe incidents to OSHA. They can call their nearest area office during normal business hours, call the 24-hour OSHA hotline at 1-800-321-OSHA (1-800-321-6742), or they can report online at www.osha.gov/report_online. For more information and resources, including a new YouTube video, visit OSHA’s webpage on the updated reporting requirements. When employees are required to do maintenance on the heating and cooling equipment located on the roof they must be protected from falls. The solution must comply with OSHA (Standards-29CFR) 1910.23 and 1926.502. The simplest way to do this is with a roof guard rail system that is easy to install, requiring no tools and does not damage the roof. 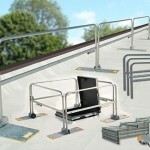 Roof Zone has developed a product, the RZ Guardrail System, that meets these requirements. Made in the USA, it’s the quickest and easiest guardrail system to install and remove, requiring no tools, no permanent installation, and galvanized to eliminate rust issues. The guardrail base mount is hot-dipped galvanized with protective protective vinyl pads attached to protect roof. The base holds two rails and comes with easy grip openings on each for one or two persons to carry. Optional toe board brackets are available. The galvanized guard rail are available in 6 ft., 8 ft. and 10 ft. length. For roof hatch or skylight applications, a swing gate guardrail is available. 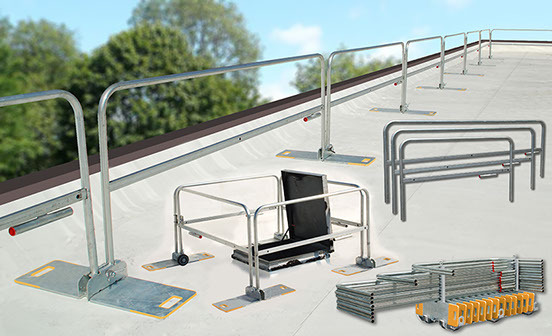 For applications where it is required to maintain sight lines while offering fall protection an optional collapsible guardrail bracket is available so the guard rail system can be laid down on the roof to maintain architectural integrity. Please visit our website for more info or call us at 800-776-3595 for more information. Welcome to the Bird Ladder Blog. ©2005-2015 Bird Ladder Equipment Co., Inc.